After the latest question time has passed almost one month, so it's time to answer your urgent (and not very) questions. The review of Audi-Technica earphones caused quite a stir on forum and in personal messages. I will answer the most popular question straight ahead – why have I left the headband of ATH-ES7 in a bent condition. The answer is obvious as you can (and should in this case) bend it only if you paid for the product. Moreover the headband can become loose and regularly keep falling from your head. The second question was if the headphones were genuine. After the review of Sennheiser IE4 I received an angry letter where a reader asked to test original products only. Probably the description of the sound did not match his idea of this model. At the same time, the sample I tested was official and legally imported to Russia. The model is quite interesting and I recommend to read the review if you have missed it. Besides, read an article on Doctorhead.ru website about ways to distinguish fakes from original gadgets. The difference is in text on the inside. I guess (though it should be additionally studied) that my sample was destined for European market, hence the text in French. 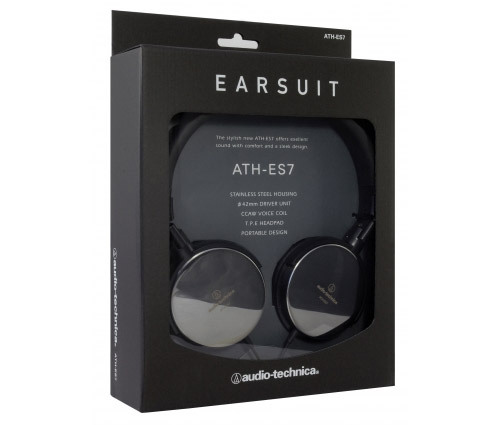 I was looking forward to your review of ATH-ES7 not because I wanted to get an expert assessment of the sound quality, build and ergonomics, but to know what you think about the price of the model. Around one month and a half I purchased it for $75 online. It is twice lower than the minimal price you mentioned! I didn't hesitate as other shops offered a price two times higher. Then I started looking for explanations and the only idea to cross my mind was that I must have bought a fake product. the manufacturer is not specified, but digits under the bar code are identical to ones on your model apart from the last 5, which makes me think that the model is from Japan. What can I say? When we want to economize the risk of buying a fake product is high. We will speak about counterfeited Monster headphones as it deserves a separate article. If you need the sound and not the looks it is worth paying more to purchase an original model from the trusted vendor. When you buy from an individual – scrutinize the package and test the sound. There is no other way out. Please, help те to choose a headset for iPhone 3GS. I tested many models, but returned to the first one in the form of Sennheiser px100. I already own its second version (II). I need an in-ear headset with the similar or better sound. What can you say about Apple in-ear, Sony MDR 300 iP, Ultimate Ears Metro.Fi 220vi and Klipsch Image S4i? Is there at least one model in the list worth trying? I somehow like Sony, but its products traditionally have too much bass, while I need a natural sound without excesses. I listen to heavy metal only. I am looking forward to your expert opinion. Dear namesake, I have only tried Apple in-ear from your list and my impressions are not the best, while the original model costs around $160. If you want to listen to heavy metal you may forget about the enumerated products, raise your budget a bit and buy, for example, Phonak Audeo PFE 121, which is a version of PFE 111 with a microphone and a button. The review of the model without the microphone and button can be read here. I have a question – do you want to read my review of Apple in-ear? I hope that my humble opinion was interesting and useful.